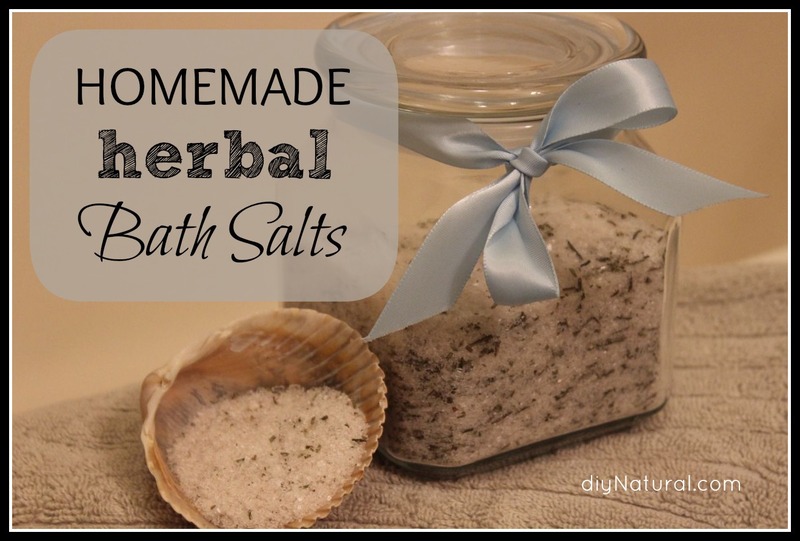 You’ll learn how to make bath salts so you can enjoy them in your tub or give them away as gifts. It’s also a great project to do with kids and/or friends. If you’re anything like me, the holiday stress is already starting to build. Each year I have to work hard to get finish everything. But at the same time, I allow a few moments to decompress so I can enjoy everything the holidays have to offer. With this busy time of year upon us, and my muscles still sore from our recent move, I thought a long soak in an herbal bath sounded perfect. When I make bath salts I only use a few basic ingredients that I always have on hand. So bath time, here we come! Combine all ingredients in a bowl and mix well. Transfer to a glass container with a tight-fitting lid. Add approximately ½ cup of bath salts to warm running bath water. First of all, this main ingredient helps relax mind and body. Furthermore, soaking in Epsom salt can help provide soothing relief from stress, sore muscles, and stiffness. And since many people are deficient in magnesium, a warm Epsom salt bath is a great way to supplement magnesium levels. Also, Epsom salt is widely available at grocery stores, pharmacies, or online. Real sea salt contains many detoxifying trace minerals. And in a warm bath, your body will absorb these minerals helping detoxify the body. Bathing with sea salt can also help revitalize and hydrate the skin, thus improving the appearance. Unrefined sea salt can be found at most health food stores, some grocery stores, or online. Certain essential oils can have healing properties for skin, while others offer mood-boosting benefits when used for aromatherapy. Pure essential oils can be purchased from health food stores or online at Mountain Rose Herbs. If you are pregnant or nursing, consult your health care provider before using essential oils. And NAHA and most others regard lavender and a few other essential oils safe during pregnancy. Many dried herbs and flowers possess the same lovely scents and healing properties of their essential oil counterparts. They’re a beautiful addition to homemade bath salts. The only drawback is they can create a mess in the tub. If adding dried herbs or flowers to your salts, it is best to use a muslin bag (like this) for your salts. Creating a re-usable “tea bag” like this will allow the salts to dissolve in the bathtub, and once the bag is dried, the herbs can be easily emptied. Play around with some different scent combinations for different therapeutic and aromatic benefits. Try eucalyptus and spearmint essential oil for an uplifting, relieving soak. Or lavender and chamomile for a calming, relaxing, pre-bedtime bath. Peppermint would make a wonderful revitalizing bath salt for the holidays when you need to be refreshed after all your hard work. Make bath salts to give away as gifts for teachers, as holiday gifts, or as the perfect hostess gift when staying with friends or family. If giving as a gift, don’t forget to add a silky ribbon and a fun tag or label. Include a spoon or a seashell for scooping! Have you ever tried to make bath salts? Help build the community by sharing the creative scent combinations you’ve come up with. Here is another homemade bath salts recipe. Health Uses of Epsom Salt. Epsom Salt Council. Accessed March 2019. Essential Oil Safety During Pregnancy. National Association for Holistic Aromatherapy. Accessed March 2019. Lavender, juniper, and rosemary sound like such a lovely combination. I really liked how you shared the recipe but also how you shared the benefits of the bath salt ingredients. I would like to make this for christmas gifts … what is shelf life for this recipe? By adding a few drops of food coloring, would.that affect shelf life? The dry ingredients have a very long shelf life…several years. However, essential oils will lose their potency if exposed to light and heat, and dried herbs tend to lose their smell after about 1 year. So if making for gifts, you may want to add essential oils and optional herbs right before giving them away to ensure your recipients have a fresh batch. I don’t think food synthetic food coloring will affect shelf life, you could probably add that to the salts long before giving it away. If using natural food colorings, you’ll want to add those right before gifting the bath salts. Great idea! I made one recently that had grated fresh ginger and orange essential oil. It was so refreshing and energizing! It wasn’t shelf stable because the ginger was fresh, but I imagine you could make it with dried ground ginger with a similar outcome. Always enjoy your posts. Often like to print out a recipe but don’t see that as an option. To accommodate I have to copy the text to a word file and edit it from there. Would love to be able to click the “print” button. Is that an option and I don’t see it? If not, maybe you would consider adding it. That way all your brand information shows up on the sheet I print and I always know where it comes from. Our webpage doesn’t currently have this nifty “print” feature, but we have talked about it several times and it will be coming soon! Thanks for the suggestion! 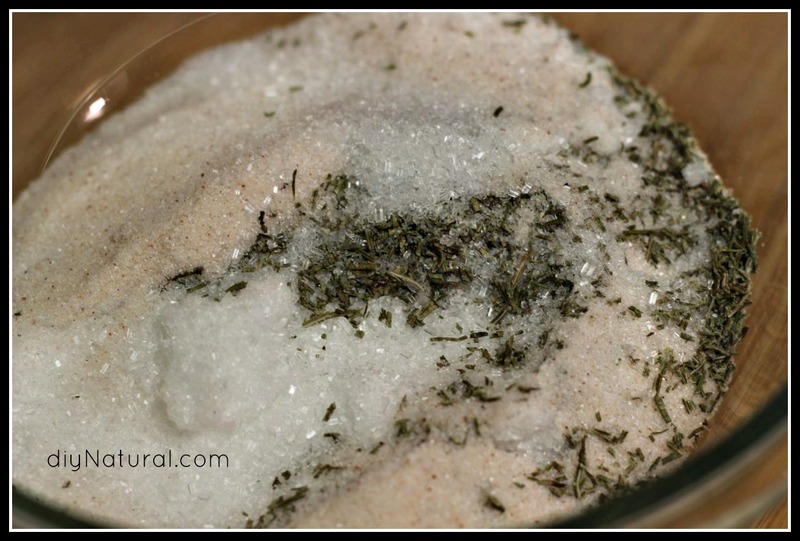 These tips for homamade herbal bath salts sound awesome. Should try them sometime. 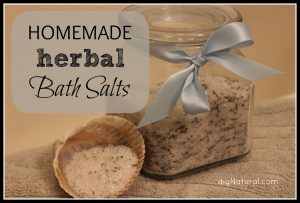 I’ve never tried to add bath salts when taking a bath let alone try to create my own bath salts from various ingredients but if I’m pleased with how they work, then who knows it might become a habit of mine to use bath salts more often. I found a great site ( http://www.saltworks.us ) with excellent bulk prices on many kinds of sea salt. My question is – will any kind of sea salt be fine in this bath salts recipe or do we need something specific? I love the idea and would like to make some up for xmas presents. Thanks for all your wonderful ideas! Any kind of sea salt will work in this recipe. If you want to add color, using something like Pink Himalayan Sea Salt gives a nice effect. Have fun making your gifts! I would love to make some of this. Doesn’t the epsom salt dissolve when you put the oils in? 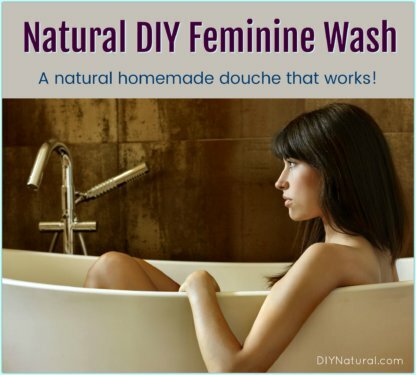 I love this because I take Epsom salt baths now, but would like the addition of sea salt and essential oils. I love your idea of using a sea shell as a scoop too! Will definitely use both of these ideas with gifts! OOOH, also, Your local Goodwill usually has all kinds of glass containers to put this in for yourself or gifts. Another way to recycle, re-use! Yes! That’s exactly where I got the glass container pictured in this article! Similar ones can be purchased pretty inexpensively at Hobby Lobby or other craft supply stores, but I always like to re-use & re-purpose whenever possible. Good question Debora! 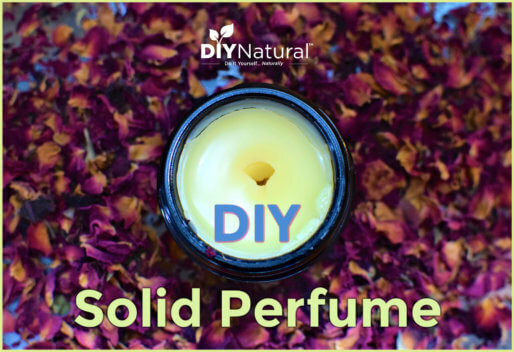 Use a dropper to add the essential oils and you won’t have an issue with the salt dissolving. You’re really only using a tiny bit of oils in relation to the amount of salts being used. What a wonderful gift idea; thanks for the reminder! I have some dear Family of Choice who work just as hard as I do and get stressed. This will be the perfect thing to give them that will be earth-friendly and inexpensive to make. Lavender , rose geranium or clove for the gals; peppermint,.basil or rosemary for the guys. 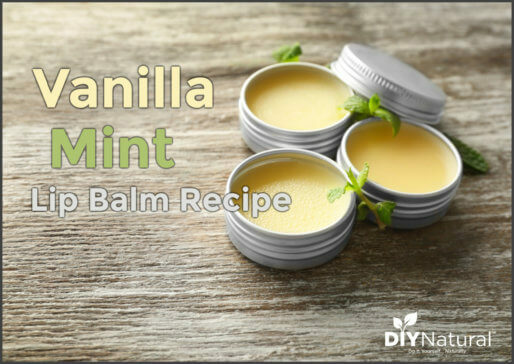 I read somewhere that if you add in some glycerin, for the proportions of this recipe it would be about a tablespoon, it would also help sooth the skin as well as cleanse and relax. Also if I’m making several batches of different flavors, I add in just a couple drops of food coloring so I’ll easily be able to distinguish between them. Great ideas Susi! Basil sounds wonderful, and glycerin would surely be a great addition. This looks great! I’m going to do this when I get home from work today! It’s a perfect gift idea too! Thanks so much for all your hard work and ideas that you share.